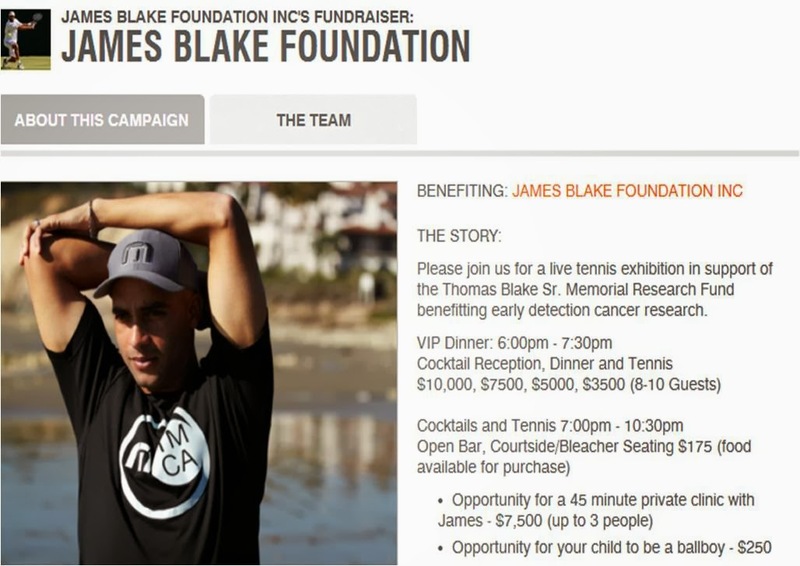 Long live the J-Block and the James Blake Foundation, Inc.
James will be hosting his (mostly) annual Serving for a Cure Fundraiser in NYC this December. Rumor has it that James' friends Andy and John will be in attendance. Read more and check for more details here and here. GlamSpinTenniswas thrilled to hear from Fila's marketing rep to get the scoop on Fila's 2015 Australian Open Platinum Collection. According to Fila the "Platinum collection features INVISTA’s THERMOCOOL ™ fabric, designed to optimize the body’s natural thermal capabilities through smart fiber cross-sections: Duoregulation ™ adapts to the wearer’s needs." On the women's side, Jelena Jankovic, Julia Goerges, and Vera Zvonareva will be sporting the platinum designs which feature pink accents in both Jelena's and Julia's kits. Francine Candiotti, Fila's tennis design expert explained exclusively GlamSpinTennis (by email), that the "diva pink" highlights were selected "...as an invigorating, luminous color that would flatter all skin tones." "This playful feminine pink was paired with white and shadow black. We used THERMOCOOL™ fabric in this collection, which absorbs the color beautifully! Well...it's been 2 years hasn't it. That's what heading to grad school will do to a person. Sometimes the axiom, 'the more things change, the more they stay the same,' rings true. But sometimes, as with the case of the US Open's new logo, one steps away, and comes to find that things have gone completely awry. Is this Arial font? Are these letters lower case? Really, in this political climate, lower case US? Is lower case an affront to becoming great again? Also, is this logo actually in Arial Italics? According to the USTA, "the logo created by renowned graphic design firm Chermayeff & Geismar & Haviv, is a streamlined and modernized version of the tournament’s iconic flaming ball logo, which was first introduced in 1997." The old logo had a solid 20-year run. This logo probably won't make it this long because it lacks pizzazz and lacks the distinction the previous logo offered. Rafael Nadal took an hour to work on his forehands in the new Louis Armstrong stadium at the US Open, today. Accompanied by his champion coach, Carlos Moya, Rafa spent the session working on down-the-line forehands and serves. Rafa appeared to be at ease during the practice session but tensed up during as he practiced serving. Overall, this was one of the more aggressive practice sessions this blogger has seen and one the first times seeing a male tennis pro with male hitting partners and not other pros. I suppose this is one of the benefits of having a Grand Slam winning coach.